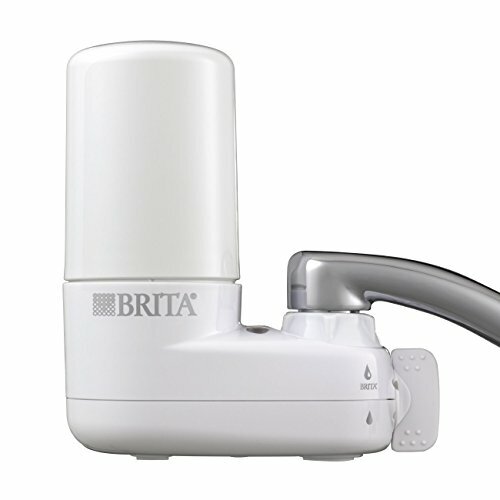 Brita Basic On Tap Faucet Water Filter System attaches directly to your tap. This easy and convenient water filter system reduces chlorine taste and odor, lead and asbestos contaminants commonly found in tap water. It also removes 99.99% of cryptosporidium and giardia cysts, as well as featuring an extra layer to trap sediment. With this basic system, 1 Brita water filter can provide up to 100 gallons of filtered tap water, replacing over 750 standard 16 oz. plastic water bottles, which cuts down on waste and saves money. For optimum performance, this filter’s indicator tells you when to replace the filter. Get great taste, less waste and more savings from Brita. A tall glass of water can help you feel better and stay healthier. Brita believes it should taste good, too. That’s why their filters are designed to reduce the common impurity chlorine, often found in tap water. Use Brita-filtered water for cooking, coffee, tea, plants—and even for your thirsty pets. This easy and convenient water filter system reduces chlorine taste and odor, lead and asbestos contaminants commonly found in tap water. It also removes 99.99% of cryptosporidium and giardia cysts, as well as featuring an extra layer to trap sediment. Enjoy great-tasting water with a convenient water filtration system that attaches directly to your faucet.